(Nanowerk News) Like drums in regular drumsets, graphene membranes at the nanoscale possess a distinct set of oscillating modes that correspond to specific oscillation frequencies. The modes can be excited by applying an external voltage. In a study published in Nature Nanotechnology ("Tunable Phonon Cavity Coupling in Graphene Membranes"), researchers from Cornell University and the University of Jyväskylä, working with funding from the Academy of Finland, show that by applying an appropriate external force, a circular graphene membrane can be ‘played’ like a drumset. The particular interest of this work lies in the fact that by exciting the system at a given frequency – that is, by playing a certain note – the researchers were able to control the behaviour of the membrane at a different frequency, amplifying or suppressing its vibrations depending on the specific excitation conditions. Technically, the researchers obtained the result by applying an external constant voltage to the graphene membrane and using the voltage as a ‘tuning peg’. This allowed the researchers to control the membrane tension and thus engineer the coupling needed to control one oscillation mode by exciting the other. This coupling between different modes was made possible thanks to the exceptional mechanical properties of graphene, especially its incredible stiffness. 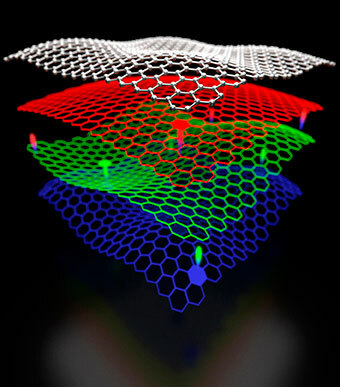 The discovery paves the way for the application of graphene mechanical resonators in telecommunication applications, for instance, as frequency mixers. Moreover, when cooled down to temperatures near absolute zero, these resonators can play an important role in the detection of the faintest quantum signals and in the definition of new telecommunication technologies in which the counterintuitive properties emerging at the quantum scale can lead to intrinsically secure exchange of information.